1. Mix the chicken pieces with salt and keep aside to marinate. 2. Mix and grind the cumin, pepper, cinnamon and turmeric powders, tamarind extract, green chillies with little water to form a paste. 3. Heat a pan over moderate heat. 4. Fry the onions till golden brown. 5. Add ginger garlic paste and fry for a few seconds. 6. Add the marinated chicken pieces and the ground masala. 8. Cover the pan with a lid. 9. Cook till the water has evaporated and chicken pieces are cooked. 10. Add warm water and cook uncovered for 5 to 10 minutes. 11. Now add the coconut milk and simmer till the gravy has thickened. 12. Add the vinegar and simmer again for a few minutes. 13. Remove and transfer to a serving dish. 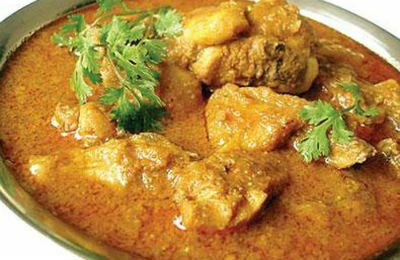 Feel free to comment or share your thoughts on this Chicken Curry with Coconut Milk Recipe from Awesome Cuisine.